Websites have made our lives easy with their easy view ability, accessibility and usability. No matter if you are student, professional, businessmen or just household; Websites are the mean of data collection, data gathering and data sharing in just a click away. The working of websites is dependent upon the amount of traffic they generate, which in returns is also calculated by the number of click made by the consumer. Websites earn by publishing ads, messages and various information on their pages. 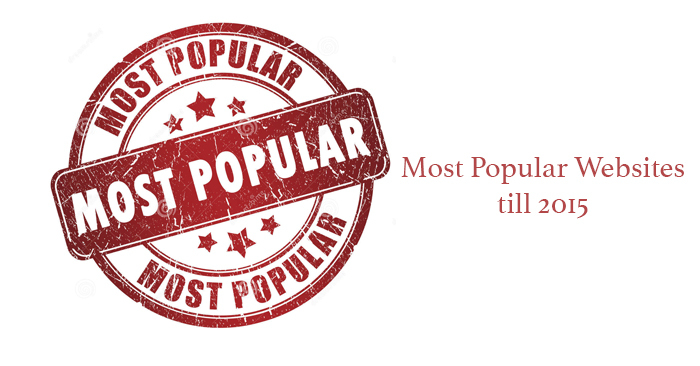 Here is the list of most popular websites. The list has been generated by the Global internet traffic agency, Alexa; and the data is as accurate as of collected in March 2015. Yes Google.com is the number one website in the list collected according to ALEXA ranking on March 2015. Google is a search engine which is making all sorts of data and information within the access of all and sundry. It is also estimated that Google gathers around 1,100,000,000 visitors each month. It is written as Google.com. In the ranking of number two website, face book has secured this position according to Alexa March 2015 ranking. Face book is a famous social media network which is linking and binding people to one another. It is a great success to face book that it has managed to score number two position in the list of most popular websites. The number of visitors per month on face book is 900,000,000. It is written as Facebook.com. YouTube is the number three website as of data collected on March 2015. YouTube is a video website which is not only entertaining but also tutorial for many others. If you want to learn anything from working on MS Word to cooking some food in your kitchen, YouTube is an ultimate solution. It is not only video viewed website, it also allows video sharing. According to the data by Alexa, total number of visitors on YouTube per month is 1,000,000,000. It is written as YouTube.com. Yahoo is a website portal, which also acts as a search engine. Before the advent of Gmail, Yahoo used to be the second source of emailing along with hotmail. Yahoo is yet site in the category of most popular websites. Total number of visitors for Yahoo.com is 750,000,000. It is written as Yahoo.com. Our childhood known Amazon is also one of the most popular websites. It is a shopping site which allows buyers and selling a virtual platform to sell buy and sell their products simultaneously. Amazon is a virtual market and it introduced a new way of selling and buying. It tapped an untapped market and thus gained immense popularity. Total monthly visitors per month of Amazon are 500,000,000. According to ALEZXA, Amazon is ranked 12th in the list of most popular websites. It is written as Amazon.com. Wikipedia, a free encyclopedia is another landmark in the list of most popular websites. It is also a sort of search engine which is bombarded with so much information which is authentic. The total traffic per month on Wikipedia is 475,000,000. It is written as Wikipedia.org. Like face book, Twitter is yet another innovation in the domain of social media websites. Twitter is largely accepted and liked by people from all across the globe. The website has also gained much popularity in a very short span of time. However as compared to face book which allows as much word spacing as possible, twitter has a threshold of message equal to 140 characters only. It is largely used by celebrities when they intend to reach their fans. At one time, it was thought that Twitter may grab the market of face book also but it never happened. The total number of traffic grabbed by twitter per month is 290,000,000. It is written as twitter.com. Bing, yet another search engine which was thought to be a direct competitor of Google.com. However Bing is also widely available and used by many, but it is always a second option for all those who use Google as a primary search engine medium. Total traffic on Bing is 285,000,000 according to Alexa march 2015 data collection. It is written as bing.com. Shopping website, which makes it easier for buyers and selling to make purchase decisions through auction. eBay is largely used as an authentic and fast processing website. The total traffic generated by eBay is 285,000,000; which are almost equal to Bing; however both websites belong to different domain. It is written as eBay.com. At one time, msn and msn messenger was the only mean to chat and make friends, however with the advent of other social media networks, msn started to loose its ranking. However website is still famous among msn brand loyal people and it grabs around 280,000,000 visitors each month. It is written as msn.com. The list also include other most popular websites also, however the above mentioned are known to all and generate more traffic according to the Alexa Internet traffic data generated in March 2015.